Extended Day encompasses those important hours before school, from 7:00–8:00a for before care, and the hours after school, from 3:30–6:00p for after care. Kids like to stay after school at Forsyth because so many friends stay and there is so much to do. It's fun! So, what’s different about Extended Day at Forsyth? 1 | The first big difference is how we charge for Extended Day. You register your child for Extended Day (one-time $50 charge), and then you are billed by the half-hour only for time your child is in after care. That applies to no-school teacher work days and conference days, too. On conference days, there is no charge for childcare during your parent conference. Before care is charged for the hour of 7:00-8:00a for children who arrive before 8:00a. At Forsyth, you are not signing up and paying for a weekly or monthly “plan”. 2 | Lots of Forsyth kids stay after school. This is not the case at all elementary schools. 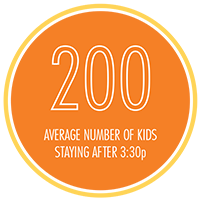 On average, 200 kids are in after care, playing sports, taking music lessons or band practice, dropping in to Math Lab, taking After-School Classes, studying in the library, and playing on the playgrounds and sport court. This is what makes it fun to stay at school after 3:30. And since our playgrounds are the backyards of houses, it all feels like a neighborhood park. 3 | We’re big on sports here. Forsyth participates in the Clayton Recreation League, and 85% of Forsyth students participate in one or more league sports: Soccer, Girls Volleyball, Basketball, Baseball/Softball/T-ball. Our athletic program is great preparation for secondary school. Practices are after school, and games take place in the Center of Clayton or Clayton fields. Pre-K and Junior-K have the option to sign up for soccer (run by Vetta Sports at Forsyth). 4 | How is after care structured? The after-care hours begin with attendance and snack, and then students are sent off to scheduled activities. All sports have set days for their practices. Band is on Mondays and Wednesdays. After-school classes begin between 3:45 and 4:00. Study hall is in the library every day from 4:00-5:00p. Private piano lessons are available on campus; lessons are scheduled by the piano teachers. Students not signed up for a scheduled activity play outside, weather permitting, gather in the game room or New House Lunchroom. The after-care day ends with all the students together for a small second snack and on to the School office for the final pick-ups. 5 | What else is going on after school? After-School Classes are offered on a trimester basis and there are always offerings for every age, including Pre-K and Junior-K. In the past, classes have included chess, 3D printing, rock climbing, video production, art classes, PomPoms squad, Teddy Tennis, calligraphy, and more. In the spring, there’s Girls on the Run (Grades 3-6) and Girls on the Go (Grades 1 & 2). The Forsyth math teachers run Math Lab after school, and children may drop in for some math challenges. 6 | A great Extended Day team makes the difference. The Extended Day staff is carefully chosen, trained and guided to provide the most competent and compassionate care for the children. They monitor all of the afternoon’s activities, get the kids to sports practices, music lesson, after-school classes and more. When there are pick-up games on the sport court, more often than not, the staff is right in there playing with the kids.